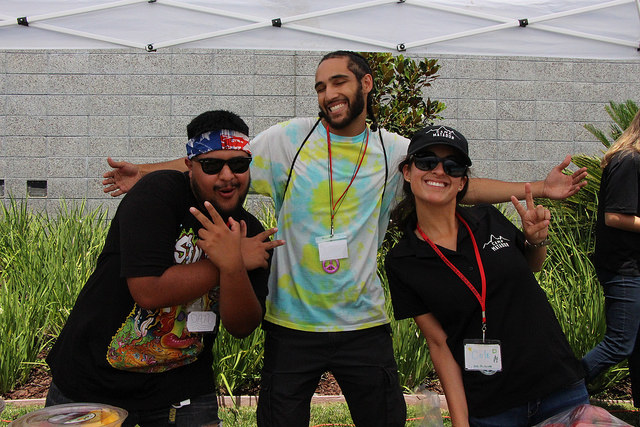 Camp Matador welcomes freshmen to Cal State Northridge by giving them an opportunity to have fun, make friends, and learn more about the Matador life here at CSUN. We hope that through Camp Matador, you will begin finding your place in the Matador Family before classes even begin! 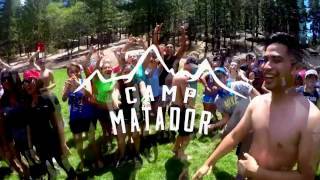 Camp Matador is a 4-day, 3-night welcome program that takes place in Big Bear, California. Students ride air-conditioned charter buses from CSUN’s campus to Ponderosa Pines Camp, where they stay in air-conditioned, furnished cabins with fellow campers. Current CSUN students serve as counselors and facilitators, leading the activities and groups throughout the weekend. Every counselor and facilitator has valuable personal experience, so they can offer advice about classes, clubs and organizations, and anything else you need as you begin your journey as a Matador! Follow us on Instagram and Facebook for updates on Camp Matador 2019! 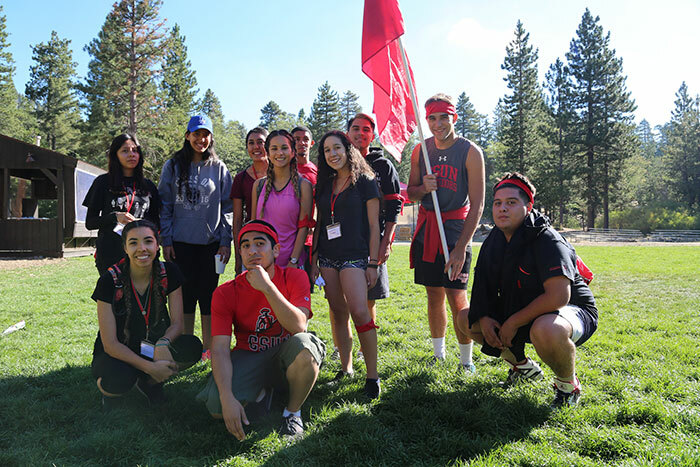 While at camp, students will receive advice and information on how to be a successful Matador, both on and off-campus, from current and prosperous CSUN students living the Matador life. Campers will be busy participating in activities throughout the 4-day experience that will give every student a better idea of what being a Matador entails, as well as an understanding of the community that exists here in Cal State Northridge. During the four days, students spend time getting to know fellow classmates and campers, counselors and facilitators, and staff while participating in activities that highlight the Matador college life. This program is run by current CSUN students who are passionate about Camp Matador and CSUN, allowing for personal experiences to be shared as they help guide the campers through the experience. We offer dozens of activities over the duration of camp such as slacklining, swimming, volleyball, basketball, soccer, life size board games, intramurals, and a variety of team building games and challenges, all the while creating connections with current Matadors and fellow campers and inheriting the culture that exists here at CSUN. For any questions or for additional information, please contact us at camp.matador@csun.edu. The Camp Matador fee is $165 and must be paid with a credit card at the time of registration. What does this fee include? Besides 9 meals, transportation to and from camp, and lodging; this fee covers the water balloon costs, the Camp Matador T-shirts, the team bandanas, and a Cal State Northridge water bottle. A full refund will be given to students who cancel prior to July 1st, 2019. A partial refund of $100 will be given to students who cancel between July 1st, 2019 and July 15th, 2019. No refund will be given to students who cancel after July 15th, 2019. Recipients will receive $165, which is equal to the cost of registration. If you register before the Recipients are announced, and you are selected, you will receive a full refund. Please print, fill out, and bring these three forms with you to Camp Matador. It is very important for each student to bring these forms completed when they arrive to campus, as they will not be able to attend unless we have all three of these documents. 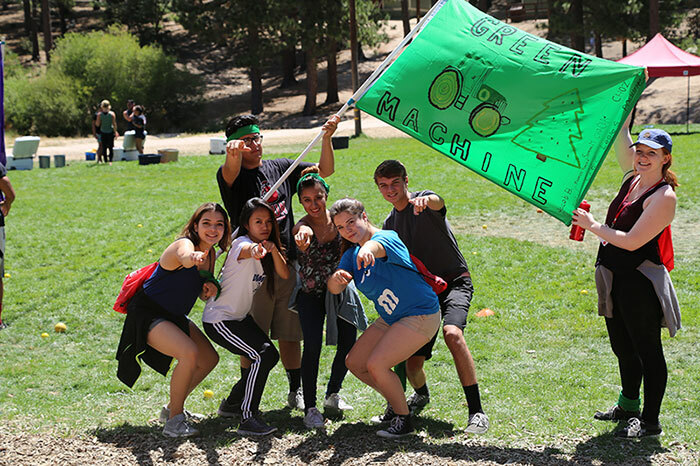 Camp Matador is a place where students have fun, problem solve and create lasting friendships that they can carry throughout their college career. It’s a great opportunity to make new Matador friends while having a great time. During the four days, students spend time getting to know classmates, counselors and staff while participating in activities that highlight life at college as well as opportunities and services available on campus. Who can attend Camp Matador? Camp Matador is only open to freshmen who are enrolled in the Fall of 2019 semester at CSUN. How many people will attend Camp Matador? There will be up to 120 incoming freshmen attending Camp Matador. Additionally, there will be roughly 40 total staff, including counselors, facilitators, photographers and videographers, and camp directors. How big will my group be and how is it determined? Although there will be 120 total students at Camp Matador, your individual group will only consist of 10 freshmen and 2 counselors. These groups will be randomly selected and be given a color bandana to represent your team. What are Camp Matador counselors like? 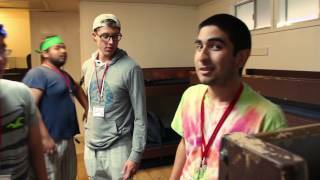 What activities can I expect during camp? There will be a variety of activities including ziplining, swimming, water balloon tosses and relays, ping pong, intramurals, team building challenges, and much more! Are there other CSUN programs that conflict with the Camp Matador schedule? Please check directly with other organizations to confirm any scheduling conflicts. Students will check in at CSUN inside the Student Recreation Center. Students will then be taken by bus to Ponderosa Pines Camp in Arrowhead, which is approximately two hours from the CSUN campus. How much does Camp Matador cost? The cost of camp is $165. 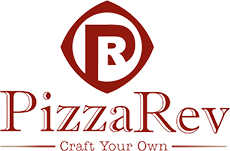 Payment is collected as part of the online registration process. The cost of camp includes lodging, chartered bus transportation between CSUN and Ponderosa Pines Camp, programming, meals and a camp T-shirt. The only extra money you may need to use would be for drinks from vending machines. You can register online. If you have any questions feel free to email us at campmatador@csun.edu anytime. Yes! We have limited space for Camp Matador, so register as soon as possible. 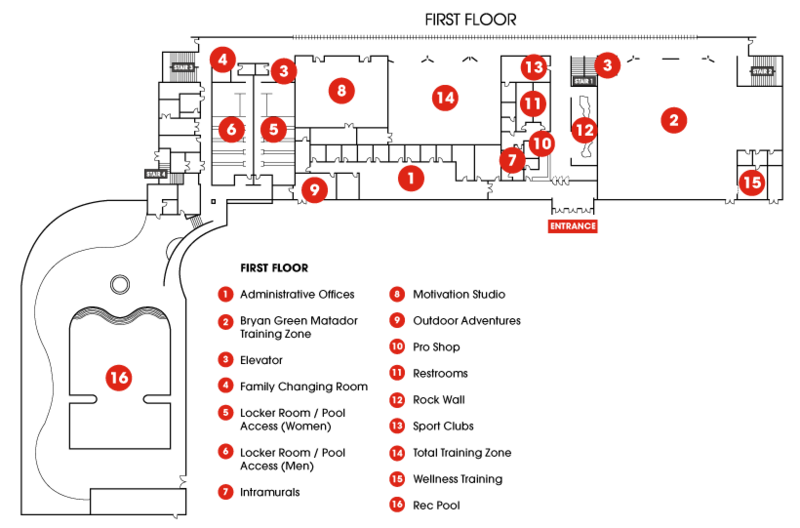 If camp openings fill up, your name will be added to the waiting list. If I am registered, is my spot guaranteed? If you have registered and paid for camp, you are guaranteed a spot. If you are attending make sure not to forget to bring all required paperwork to the first day of camp. Scholarship information for Camp Matador 2019 will be updated in 2019. What is the required paperwork for the camp? The required paperwork for camp includes the Camp Matador Permission to Treat, Camp Matador Acknowledgement of Risks and Release Form, and the Ponderosa Pines Medical and Liability Release Form. I’m not 18. Can I sign my own forms? If you are not 18 by the time camp begins, you will need a legal guardian to sign your forms. A full refund will be given to students who cancel prior to June 1st, 2019. A partial refund of $100 will be given to students who cancel between June 1st, 2019 and July 15th, 2019. No refund will be given to students who cancel after July 15th, 2019. How do I notify you about my special needs, dietary restrictions, etc.? Please contact the Camp Director at to discuss special accommodations. What if I’m having trouble with online registration? If you are having any problems with registering online, please contact us at (818) 677-4453 or email . What if I don’t remember my SRC username? If you created an account with the Student Recreation Center and are having trouble logging on and/or you forgot your username please contact the IT department at CSUN at http://www.csun.edu/it. Overnight parking is not allowed anywhere on campus. Parking is only allowed off-campus. We highly recommend getting dropped off on Thursday and picked up on Sunday. The best place to be dropped off would be the G3 parking lot, and then walk to the Student Recreation Center for registration. 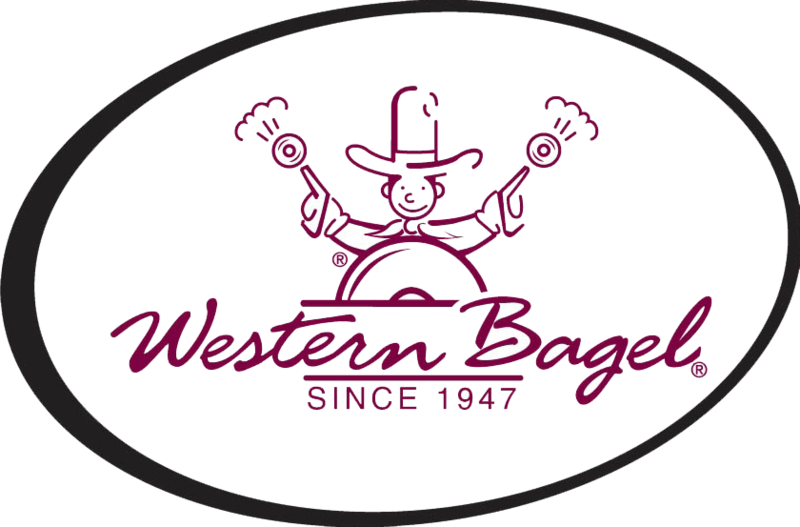 If you have any issues during the morning please contact us by calling (818) 677-4453. What if I’ve never been camping and I’m not an outdoors person? All campers will be sleeping in a cabin on bunk beds. There will be restrooms inside the cabins, which include showers. Camp Attendees will spend most of the time outside, but all meals will take place inside of a mess hall. Bring the following to camp. Comfortable and modest clothes for recreation and activities. Shorts and T-shirts are appropriate for all activities and you may want more than one set per day. Protection from the sun, such as a hat, sunscreen and sunglasses. This is a sanctioned CSUN event and any violations will be handled in cooperation with the university police or university disciplinary council (see the New Student Handbook). Students who violate these policies will be asked to leave camp without a refund. There may be service with certain carriers at the camp, but cell phones will not be permitted during activities. 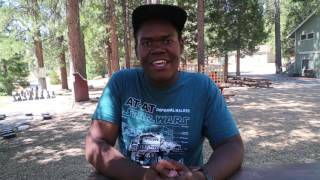 If you need to reach a student while he or she is at camp, you may call Ponderosa Pines Camp at (909) 867-7037 and leave a message, which will be delivered at the next meal. Of course we do! You do not need to have an expensive costume to participate. We encourage outside-the-box thinking, as long as it is appropriate. Flannels and jeans work great! 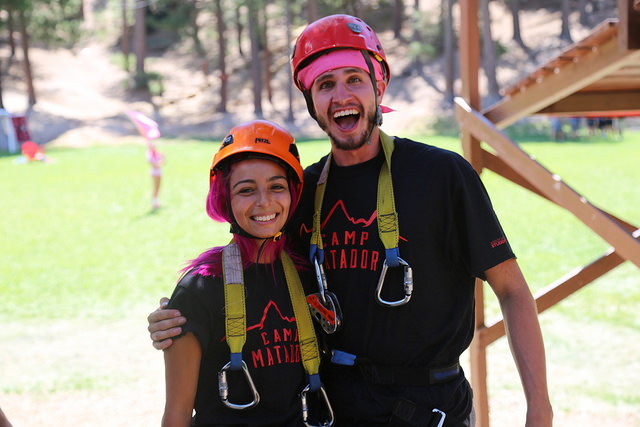 As a Camp Matador Counselor you will spend Camp Matador working directly with the new Matadors. Pairs of Counselors will bunk up with the groups of incoming freshmen and guide them through the weekend and into the Matador culture. Their primary duties include creating and providing a support system and to help facilitate the transition from high school into college. Counselors will answer questions and serve as a role model for all of Camp Matador attendees. 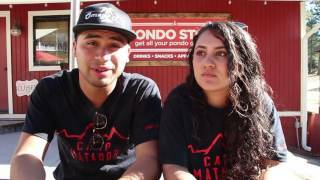 Camp Matador Facilitators will serve as the staff for Camp Matador. Facilitators will work closely with the Camp Directors and the Camp Coordinators, to generate the best possible experience for Camp Matador attendees. The two primary duties of the facilitators will consist of running activities and completing the behind the scenes operations and logistics. Sounds like fun huh?